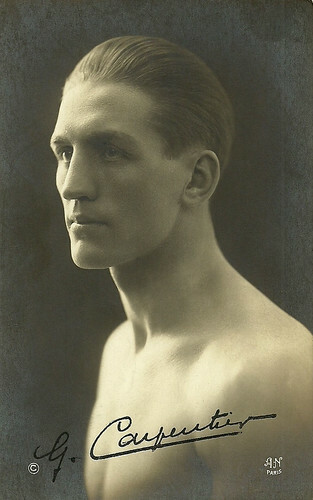 French boxer and war hero Georges Carpentier (1894–1975) reigned as the world's light heavyweight champion in 1920-1922. 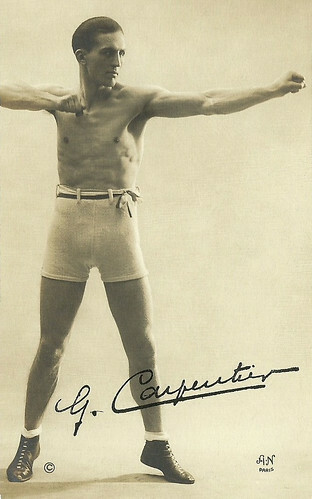 Nicknamed ‘L'homme à l'orchidée’ (the Orchid Man), the learned Carpentier was known for his speed, his excellent boxing skills and his extremely hard punch. Legendary is his fight for the world's heavyweight crown with champ Jack Dempsey, one of the highlights of the Roaring Twenties. After his boxing career ended he worked as an entertainer in vaudeville and appeared in half a dozen of films. 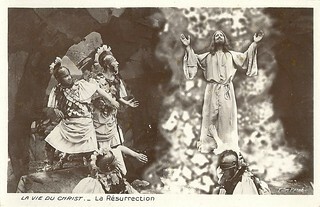 French postcard by A.N., Paris, no. 3, 1921. French postcard by A.N., Paris. Collection: Didier Hanson. Georges Carpentier (pronounced car-pont-yay) was born in Liévin near Lens, France in 1894. Carpentier began his career by progressing up through the weight divisions, fighting in every division from welterweight upwards. 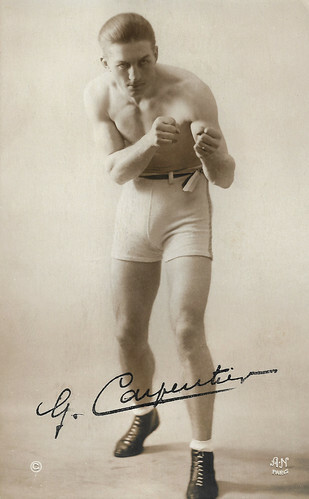 Turning pro at the age of 14, Carpentier first won the European welterweight championship in 1911. He became middleweight champion of Europe in 1912, and light heavyweight champion of Europe in 1913. That year, he beat ‘Bombardier’ Billy Wells in Ghent, Belgium to become heavyweight champion of Europe. He defended his title later that year against Wells, in 1914 against Pat O'Keefe and in London he beat Ed ‘Gunboat’ Smith to add the ‘White Heavyweight Champion of the World’ to his European title. During World War One, Carpentier served as an aviator, winning the Croix de Guerre and the Médaille Militaire, two of France's highest military decorations. This served to heighten his already phenomenal popularity, not only in France but in the United States and England as well. Carpentier defended his title twice again in 1919 before dropping down a weight to challenge Battling Levinsky for the light heavyweight championship of the world. The fight took place in 1920, in Jersey City and Levinsky was knocked out in the fourth. Carpentier's attempt at the heavyweight Championship of the world came in 1921, again in Jersey City, when he faced Jack Dempsey. This fight was the first million dollar gate in boxing history. Living up to his nickname, Dempsey mauled Carpentier in the first three rounds before knocking him out in the fourth. Carpentier never fought again for that title. He lost his world light heavyweight title and his European heavyweight and light heavyweight titles the following year in a controversial bout with Senegalese fighter Battling Siki. His last truly noteworthy fight was in 1924, with Gene Tunney at the Polo Grounds in New York. Carpentier lost the bout by TKO after fifteen rounds. 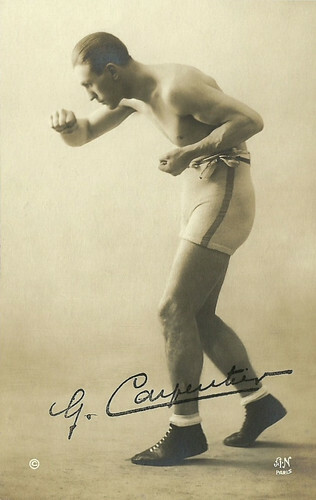 In 1927, the 33-years-old Carpentier retired from the ring. French postcards by A.N., Paris. Collection: Didier Hanson. Georges Carpentier was considered as the most learned man that ever stepped into the ring. And indeed, he is the author of the novel Brothers of the Brown Owl a story of the boxing ring (1923). 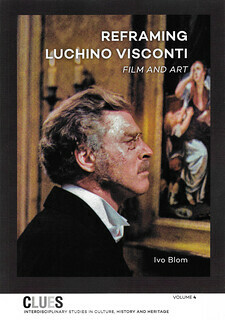 American magazine Photoplay wrote in 1920: “He is very fond of good literature and the opera. He sings and plays the piano with professional skill.” After the ring, Carpentier spent a number of years as a vaudeville song-and-dance man, mostly in England and the US. 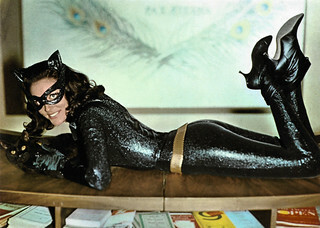 He also appeared in several films. Carpentier starred in both silent and sound films. In 1913 he had already made his film debut in the short Une aventure de Jack Johnson, champion de boxe toutes catégories du monde/Jack Johnson's Adventures in Paris (1913, Henri Pouctal) starring African American boxing champion Jack Johnson as himself. Seven years later followed Le trésor de Kériolet/The treasure of Keriolet (1920, Félix Léonnec) with André Nox. In England he made A Gipsy Cavalier (1922, J. Stuart Blackton) with Flora Le Breton. In France he was seen in La symphonie pathétique/Pathetic Symphony (1928, Mario Nalpas, Henri Étiévant). Carpentier made three films in Hollywood: the silent adventure drama The Wonder Man (1920, John G. Adolfi), the musical The Show of Shows (1929, John G. Adolfi) with John Barrymore, and the musical comedy Hold Everything (1930, Roy Del Ruth) in which he is mixed up with comedian Joe E. Brown! Ruined by the Wallstreet Crash, he returned to Paris. Carpentier’s last screen appearance was in Toboggan/Battling-Geo (1934, Henri Decoin) with Arlette Marchal. Soon after, he bought with his last money a bistro in a chic Paris neighborhood and named it Chez Georges Carpentier. Wikipedia adds that Georges Carpentier and his one-time opponent Jack Dempsey would remain close friends throughout their lives. From 1921 on they visited and forth in New York and Paris, getting together to commemorate anniversary of their famous bout and exchanging birthday greetings. Like Carpentier, Dempsey became a restaurateur. At 81, Carpentier died in Paris in 1975 of a heart attack, and was buried in the Cimetiere de Vaires-sur Marne, Seine-et-Marne, France. He was married to Georgette Elasaser. In 1991, Georges Carpentier was posthumously elected to the International Boxing Hall of Fame. Jack Dempsey vs George Carpentier. Source: SweetFight (YouTube). Georges Carpentier sings If I Could Learn to Love as Well as I Fight in The Show of Shows (1929) with Patsy Ruth Miller and Alice White. Music by M.K. Jerome, lyrics by Herman Ruby. Source: Atqui (YouTube). Sources: Jon C. Hopwood (IMDb), Nicolas Zeisler (Cultureboxe) (French), Silent Ladies and Gents, Wikipedia and IMDb.